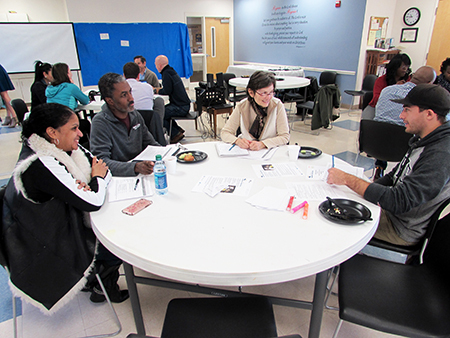 Durham residents at a Healthy Durham 20/20 Community Listening Session in Fall 2017. Listening to the ideas of Durham community members is a central tenet of Healthy Durham 20/20’s mission. That’s why, over the Fall and Winter of 2017-18, we held a series of six Community Listening Sessions open to anyone in Durham, seeking your ideas about how to move forward in the pursuit of health equity. These sessions attracted a diverse group of community members, representing broad racial, socio-economic, and educational backgrounds—from community activists and longtime residents to college students Healthy Durham 20/20’s community engagement team posed questions and listened as Durhamites shared their insights. What can we do to make sure that your ideas are used to improve the health of our community? How do we engage the community in sustainable ways? Is this type of meeting the best way to keep you engaged, or would some other platform be better? Participants urged us to actively seek out community voices, and not to shy away from hard conversations. They stressed the importance of giving the community credit for work they’re already doing to empower themselves and their neighbors, and to capture stories of success and failure both in Durham and elsewhere. There were plenty of ideas for promoting health, ranging from fresh food access, to universal preschool, to living wages. Read the full report here: Community Listening Session Report Fall 2017. Interested in being part of the health equity conversation? Your next chance is at the Durham Health Summit on June 8th—information and registration here!